As the Indian MoD is all set to send out documents that will kickstart the long-awaited P75 India submarine-building programme, India has approached Japan to gauge its interest in competing for the contract with its Soryu-class new generation conventional attack submarines jointly developed and manufactured by Mitsubishi and Kawasaki Heavy Industries in Japan. Strengthening ties between the two countries, buttressed by a strong personal equation between Prime Minister Narendra Modi and his Japanese counterpart Shinzo Abe is understood to be the basis for the interest. 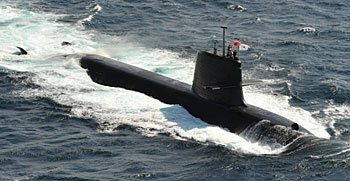 The brand new submarine class began entering service with the Japanese Self Defence Force in 2009 and have the largest displacement of any submarine used by post war Japan. The other likely contenders in the deal, as reported earlier by SP's, including DCNS with the Scorpene (with modifications), Navantia with the S-80, Rubin Design Bureau with the Amur 1650 and HDW with the Class 214.